Calling all thrill seekers in Sheffield! Come and experience this brand new, state of the art indoor go karting venue located just 2 miles from Meadowhall Centre. There are 3 tracks over 4 levels with nail biting bends, exhilarating long straights and jaw dropping ramps, it’s sure to test your driving skills to the absolute limit! Book now and try the ultimate indoor karting experience! If you live in South Yorkshire or simply plan on visiting Sheffield for a big night out with friends, make sure you put some time aside in your diary to check out the all new TeamSport circuit on Shepcote Lane. This new, unique venue has 3 tracks over 4 levels which are sure to test any drivers racing ability. For much larger groups there are the 950m international track that’s capable of holding up to 20 karts at one given time. This one really is the ultimate for any larger groups – such as corporate events or stag do’s – looking for an event they'll remember forever. 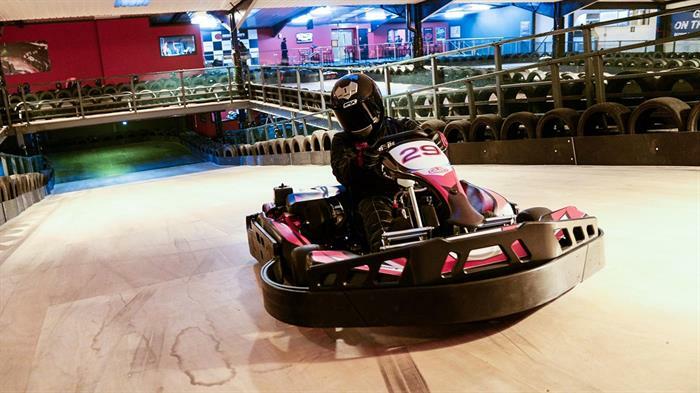 Each track runs over four different levels, meaning you and your pals can go head to head in a slick, professional environment that leaves traditional go karting track layouts for dust! What's more, the Biz Petrol Karts are capable of reaching speeds of 40mph, which is perfect if you're looking to get the heart thumping and adrenaline pumping. Obviously, whizzing around in a Petrol Kart can be a lot of fun, so that’s why there are also a whole host of smaller Karts available for younger racers looking to channel their inner Hamilton. These are ideal for all youngsters – even those who haven’t been karting before – and perfect for those who fancy having their birthday party here at TeamSport, they'll be able to hit the track with all their pals while Mum and Dad relax, safe in the knowledge that their kids are having fun and staying safe at the same time. The Sheffield track is the perfect alternative venue for corporate functions too – and we even offer a hi-spec meeting room so businesses can deliver their big presentation before hitting the track with clients or co-workers. There's a fully licensed bar onsite too, plus catering facilities, which is great if you're team are looking to unwind after the main event.